Are you a newsletter subscriber? If not, don't miss out. Check out our news and deals this week! Need to compose, record, or master your music? 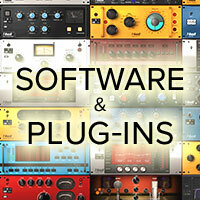 Have you been searching for that special Plug-In? How Do I Choose Classical Strings? How Do I Choose Acoustic Strings? How Do I Choose Electric Strings? What were strings made of in the past? 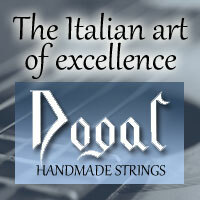 Historically, strings were made of wound gut materials with the lower bass strings wound with various metals. There are several manufacturers still making strings in the historic methods today as well as many synthetic strings designed to replicate the sound and feel of traditional gut strings. What are strings made of today? Today, there are three primary guitar string categories: strings for classical/flamenco guitars (nylon, fluorocarbon and other synthetics with bass strings wound with various metals), strings for acoustic guitars (steel, bronze, phosphor bronze, nickel, etc.) and strings for electric guitars (steel, nickel and other metals chosen for electromagnetic properties). There are many technical factors which can influence your guitar string selection. The properties of the sound and response of a given string can have a strong impact on both the player and the instrument. The relative hardness of the string's component materials in conjunction with an array of treatments the strings undergo during the manufacturing process can combine to create different degrees of sustain, timbre (warmth vs brightness), playability, and longevity. Here at Strings By Mail, we strive to have the best selection of strings at the best possible prices. That's why we are your online music store! 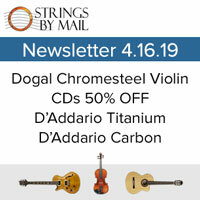 Strings By Mail proudly announces that our latest new sponsored artist is Adam del Monte. Adam’s flamenco and classical prowess are well known, and his compositional creativity has significantly enhanced the repertoire. We have tested and compiled data over time and are excited to introduce our Best Guitar Support Guide. We've designed the Guide to make it easier to choose the right guitar support for your needs.